Welcome to Skav Art! A gallery blog of all the little pictures I draw from my imagination using the most basic of art equipment that I scrounge, or buy cheaply. Think of it more as "Advanced Doodling" or "Finished Thumbnail Sketching" and you'll have pretty much sussed it. One of the better products you were able to get from comic book ads was the Exploding Army Hand Grenade﻿. It wasn't a full-sized one and was a bit crude looking (nothing like the picture) but it was pretty good in the way you could load caps into it. In this Wizbang! 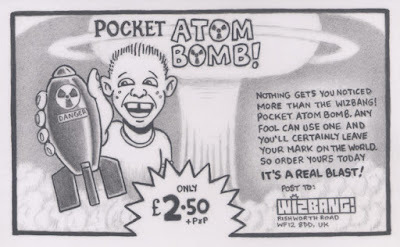 advert, I've spoofed that by having it as a pocket atom bomb that kids can have fun totally destroying their neighbourhoods with. 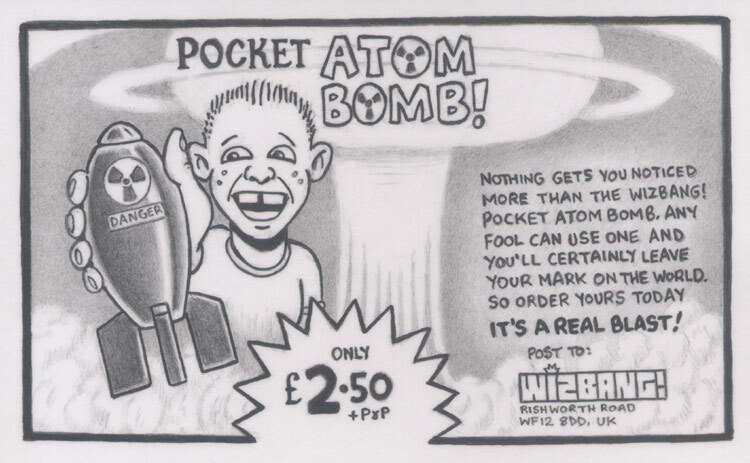 Artwork labels: advert, art, atom, blast, bomb, drawing, explosion, grenade, pencil, pocket, skav, smiling boy, wizbang, wizbang!